At present, the term “free verse” is used to describe a multitude of quite different and even contradictory strategies, several of which may be employed in the same poem. If metrical poetry can be defined as verse in which strong and weak sound-elements are patterned by numerical rules into self-similar lines, then free verse might be defined negatively as nonmetrical verse in which no such system is discernible. Though free verse doesn’t have the involved accentual-syllabic patterns of its metrical counterpart, in practice it usually makes recourse to one or more of the following strategies: loose accentualism (the counting of accents); isochrony (lines of similar duration); syntactic parallelism; aleatory (chance-determined) structure; procedural (mathematically determined) structure; word count; and even syllabic verse, since raw syllable count is its only repeating pattern. Metrical poetry evolved over vast stretches of time in what Marshall McLuhan calls the “acoustic space” of ancient, preliterate societies–a space he describes in The Medium Is the Message as “boundless, directionless, horizonless.” Such verse was composed and learned by ear, stored in memory, modified in performance, and passed down from bard to bard. Evolving with the languages and cultures in which they were composed, these songs and epics were communal works and belonged as much to a kind of collective mind as to singular poets. Like other nonlinear, dynamic systems, a formal poem is rule-governed, holistic, sensitive to initial conditions, recursive, and self-similar at different scales. It uses feedback to organize itself in a top-down, bottom-up fashion as the poet tinkers, letting rhythms form as imagination interacts with verbal patterns sounding in the ear. Small-scale elements like phonemes help determine larger aspects of the poem such as words, lines, and so on. These scaled similarities are arranged in a hierarchy of levels that reflect and influence one another, from the level of phoneme, word, metrical foot, metaphor, symbol, syntax, stanza, up to logic, theme, overall form, and the ethics and metaphysics implied by the poem’s meaning. Offsetting the self-similarity of alliterative patterns and metrical feet are the “broken symmetries” of metrical substitutions and, in some poems, the varying consonants of assonance and rhyme. The poem’s final shape is drawn into being partly by a “strange attractor,” which tradition calls sonnet, blank-verse monologue, rhyming quatrain. Finally, metrical poetry possesses another characteristic of self-organizing systems: flow. Free verse is much more recent in origin. Though it has precedents in the Hebrew poetry of the Bible (which may owe its looser structure to the patterning conventions of musical accompaniment), in Western literature it becomes prominent only in the nineteenth century, with Blake, the French Symbolists, and Whitman. These differences of derivation have had enormous ramifications for the practice of modern poetry. The invention of writing marked a paradigmatic shift in human consciousness, as McLuhan has explained: “The alphabet is a construct of fragmented bits and parts which have no semantic meaning in themselves, and which must be strung together in a line, bead-like, and in a prescribed order. Its use fostered and encouraged the habit of perceiving all environment in visual and spatial terms.” As the eye replaced the ear in the hierarchy of perception, the “boundless, directionless, horizonless” universe in which metrical poetry was composed was eclipsed by the linear, visual world of the written word. A second, and perhaps deeper, shift occurred with the advent of printing. Mass-produced books accelerated linear habits of thought and cognition. Though poetry in forms continued to be written–shaped by tradition; readers’ expectations; poetry’s on-again, off-again association with music; and the tendency of words to self-organize into repeating metrical patterns–the omnidirectional “aural space” of old became, as the Gutenberg era wore on, the linear “visual space” of the modern industrial world. [D]ue to its rigidity and its space precisions, it can, for a poet, indicate exactly the breath, the pauses, the suspensions even of syllables, the juxtapositions even of parts of phrases, which he intends. For the first time the poet has the stave and the bar a musician has had. For the first time he can, without the convention of rime and meter, record the listening he has done to his own speech and by that one act indicate how he would want any reader, silently or otherwise, to voice his work. It is time we picked the fruits of the experiments of Cummings, Pound, Williams, each of whom has, after his way, already used the machine as a scoring to his composing, as a script to its vocalization. The problem for the poet of thinking in these terms is that the still universe of Euclidean geometry can’t accommodate time, yet time remains an essential feature of all self-organizing, complex systems. Poetry that treats the line as a mere unit of space is therefore unlikely to achieve the same complexity as poems that elaborately pattern unfolding time. It is a poem to see with the eye, conceived in a typewriter upon an 8 1/2″x 11″ sheet of paper. If metric is a system of emphases, centered in human comfort, human hope, syllable count is a system of zoning, implied by the objectivity of the words, which lie side by side for their syllables to be counted. If the stanzas of “Go, lovely rose” are primarily audible, created by the symmetries of the uttering voice, the stanzas of “The Fish” are primarily visible, created by an arrangement of words in typographic space, the poem made for us to look at. Olson’s adherents may object that I’ve ignored his comments about the centrality to composition of “the syllable” and “the breath” and thus oversimplified his views. Charles O. Hartman makes a case, in Free Verse, that Olson did not mean to use the typewriter to supplant aural with visual prosody, but, rather, that he intended “its spatial manipulations to stand for temporal ones with a new precision.” This argument doesn’t hold, for two reasons. First, for all Olson’s mystical mumblings about “the syllable,” he gives no clue how a poet is to arrange those syllables except to say that they’re to be dispensed in equally mysterious and undefined “breath units.” Olson’s own line-lengths vary enormously. His breath units contain no internally repeating pattern; they are simply varying lengths of pure duration, like bursts of static or random sounds. This is the device known as isochrony, and a poem written according to such a measure cannot achieve the same level of self-similarity as those whose patterns at the level of foot and syllable reflect patterns at higher scales, nor can its lines share enough similarity to other lines to “break” their symmetry with subtle variations. When we talk, we depart from our usual rhythmic breathing and take in quick breaths of air, then release them steadily, using the muscles of the ribs to counteract the elastic recoil of the lungs. (If we did not, our speech would sound like the pathetic whine of a released balloon.) Syntax overrides carbon dioxide: we suppress the delicately tuned feedback loop that controls our breathing rate to regulate oxygen intake, and instead we time our exhalations to the length of the phrase or sentence we intend to utter. Olson’s Black Mountain followers, among them Robert Creeley and Denise Levertov, have continued his practice of spatializing and fragmenting syntax. Such poets tend to supplant natural word order and concatenation with manifestos on their breakdown, using the typewriter to dispose words and lines in willfully contrived units, hyphenating words, splitting and stringing clauses and phrases across lines and strophes. The poet neither lets the rhythms of syntax dictate pauses nor lets syllables coalesce into repeating rhythms that build to a line. Instead of a top-down, bottom-up interplay among syllabic configuration, syntactic unit, and poetic line, we have a top-down model of order dictated by the poet: “Position is where you/ put it,” as Creeley writes in “The Window.” There remains a crucial distinction between Creeley’s line, whose length is determined by the poet’s choice, and a metrical line, which achieves its identity only when a certain number of metrical feet accumulate from within. The physiological regulation of breathing makes natural breaths roughly isometric–in, out; in, out. And isometric breathing is the basis for regular lines, orderly and successive ones. But the gaze has no such isometric rhythm: a gaze can be prolonged at will, held for inspection, meditated on, and periodically interrupted. It is the gaze, rather than the breath, that seems to me Graham’s fundamental measure in the numbered-line poems. By this choice of the gaze over the breath, Graham redefines utterance; and what utterance becomes is the tracking of the gaze, quantum-percept by quantum-percept, bundle by bundle. William Carlos Williams once defined a poem as “a small (or large) machine made of words”–a precis that became one of the principal metaphors of modernist verse. The machine is the very embodiment of linear, deterministic processes; when we oppose it to the metaphors of Keats, Whitman, and Hopkins, who compared poems to leaves and trees, we can see just how fundamental a change occurred in the brief compass of a few decades. We still speak of a sentence’s kernel, of its branching clauses and phrases; words are said to have roots. Our figures imply that language, and especially syntax, is a living, organic thing, directed by inner laws that generate and transform it. Linguist Steven Pinker unabashedly describes speech in terms of flow, irreducible to atomistic parts: “Speech is a river of breath, bent into hisses and hums by the soft flesh of the mouth and throat.” In this view, words are not separable “objects” to be handled one after another, but nearly indistinguishable vortices in language’s turbulent flow: “In the speech sound wave, one word runs into the next seamlessly; there are no little silences between spoken words the way there are white spaces between written words. We simply hallucinate word boundaries when we reach the edge of a stretch of sound that matches some entry in our mental dictionary.” Pinker’s comments remind us that the use of space as an organizing device came rather late in the history of writing; originally words were simply run together on the handwritten page. Even the sequence of sounds we think we hear within a word are an illusion.If you were to cut up a tape of someone saying cat, you would not get pieces that sounded like k, a, and t (the units called “phonemes” that roughly correspond to the letters of the alphabet). And if you spliced the pieces together in reverse order, they would be unintelligible, not tack…. [I]nformation about each component of a word is smeared over the entire word. Individual words, syntax, and meaning are, then, inextricable from one another; and in poetry they are even more intimately intertwined and unified by metrical rhythm. Attempts to fragment, defamiliarize, and deconstruct poetic language are therefore doomed to failure or, at best, only partial success. Contemporary L-A-N-G-U-A-G-E poets illustrate this dilemma. Thinking conventional poesy to be linear and authoritarian, they strew syntactically unrelated words across a page or combine letters into unpronounceable and semantically empty neologisms in order to expose the vacuousness of poetic meaning and “command.” Yet for all their liberationist intentions, such a reductive conception of language defeats itself. Instead of opening their texts to unfettered interpretation, such authors may succeed all too well in making their work unreadable. Further, their desire to “foreground the material signifier” exposes an intellectual error that artificial-intelligence pioneers like Douglas Hofstadter call “level confusion”–a mistake analogous to confusing the melodies of Mozart with the way they’re digitally encoded on a compact disc. Chaos theory, conversely, shows how higher levels of order can “emerge” from simple processes and indicates that imaginative and moral complexities might emerge in the same way from words, syntax, and poetic forms and rhythms. Any analysis that fails to take into account what Langer calls poetry’s “harmonic structure” will fall prey to the fallacies and contradictions that plague the space-centered and deconstructive poetics of modernism and postmodernism. To avoid this trap, we must abandon modernism’s central myth–the myth of a perpetual avant-garde, a notion whose very name implies a linear conception of time and progress. For the idea that the poet is eternally progressive and forward-looking we will have to substitute a more recursive and evolutionary model of growth. If we want to invent new poetries with the kind of scaled complexity we see in nature and want to rediscover the “unifying, all-embracing artifice of rhythm” in verse, we have to turn back to the beginnings of modernism and salvage what remains beautiful and formally challenging in that epoch-making work. Forging ahead was the last thing Eliot wanted. In his best-known essay, “Tradition and the Individual Talent,” he urged the opposite approach: a poet was to find a voice, invent a style, or (in Pound’s words) “make it new” by looking backward, to the great works of the past. It was the recursive nature of Eliot’s poetics–this returning of the art “to the classroom” where traditions are expounded–that enraged Williams, arch-apostle of the avant-garde. [W]hat happens when a new work of art is created is something that happens simultaneously to all the works of art which preceded it. The existing monuments form an ideal order among themselves, which is modified by the introduction of the new (the really new) work of art among them. The existing order is complete before the new work arrives; for order to persist after the supervention of novelty, the whole existing order must be, if ever so slightly, altered; and so the relations, proportions, values of each work of art toward the whole are readjusted; and this is conformity between the old and the new. Whoever has approved this idea of order, of the form of European, of English literature will not find it preposterous that the past should be altered by the present as much as the present is directed by the past. The poet must be very conscious of the main current, which does not at all flow invariably through the most distinguished reputations. He must be quite aware of the obvious fact that art never improves, but that the material of art is never quite the same. He must be aware that the mind of Europe–the mind of his own country–a mind which he learns in time to be much more important than his own private mind–is a mind which changes, and that this change is a development which abandons nothing en route, which does not superannuate either Shakespeare, or Homer, or the rock drawing of the Magdalenian draughtsmen. That this development, refinement perhaps, complication certainly, is not, from the point of view of the artist, any improvement. [T]he most interesting verse which has yet been written in our language has been done either by taking a very simple form, like the iambic pentameter, and constantly withdrawing from it, or taking no form at all, and constantly approximating to a very simple one. It is this contrast between fixity and flux, this unperceived evasion of monotony, which is the very life of verse. Purists have quibbled for decades over whether Eliot’s practice meets any legitimate definition of form or meter. Eliot himself saw his method as an echo and outgrowth of the experiments of Jacobean playwrights, intimating that we might find in his work and that of his contemporaries “the same constant evasion and recognition of regularity” that one finds in John Webster and Shakespeare. Eliot admits there is some “irregularity of carelessness” in this mode of writing, but he insists that some of the deviations from expectation belong to an “irregularity of deliberation.” I think history will confirm the judgment of readers who trust the testimony of their ears that Eliot has given us some of the century’s best poems–work made memorable precisely because of how it appeals to the auditory imagination. Pound’s best critics have already pointed out what we might call the fractal scaling of the Cantos–though this epic lacks what may be the key element in any fractally scaled long poem: narrative. In the verbal arts, narrative is the unifying force that binds and molds small-scale movements into larger ones, and its absence in Pound’s poem not only vitiates much of his art but undermines claims that it is fractally scaled and self-similar. Still, like Eliot in The Waste Land and Joyce in Ulysses, Pound does employ another overarching, unifying device, one Eliot defined in “Ulysses, Order, and Myth” as “the mythical method.” This specifically modernist mode works, says Eliot, by employing “a continuous parallel between contemporaneity and antiquity.” Pound opens his epic with a loose translation of Book Eleven of The Odyssey, with a descent to the underworld, and after many peregrinations through history ascends in the late cantos back into myth, moving upward to what has been called the poem’s Paradiso. Even Pound’s inclusion of “history” in his most ambitious piece of work operates in a way that might accord with chaotic principles. Davie writes: “One way by which a poem might be thought to `contain’ history is by mirroring its own large-scale rhythms of discovery, wastage, neglect, and rediscovery that historical records give us notice of.” In The Pound Era, Kenner writes of how Pound’s small-scale “subject-rhymes” and larger “culture-rhymes” echo each other throughout the poem, and he has more recently–in an essay entitled “Self-Similarity, Fractals, Cantos”–attempted to use fractal geometry to illumine Pound’s epic. Kenner’s analysis is frustratingly vague, however, offering few specific examples of fractal scaling and self-similarity, and those not entirely convincing. The lack of an overall structure in the Cantos has often stymied even the poem’s staunchest defenders, who are forced to claim its very amorphousness as a virtue. Thus Kenner: “History works toward no finale; analogously, self-similarity imposes no norm of completeness. The Alps…are self-similar, from skyline clear down to boulder; and had a few mountains never been formed, we’d not deem the Alps `incomplete. '” Davie sounds a similar note: “[W]e can forget about such much-debated nonquestions as whether this poem has a structure…or again, why the poem isn’t finished, and whether it ever could have been. Does the sea have a structure? Does a sea finish anywhere? The Mediterranean boils into and out of the Atlantic…. “Despite such rhetorical finesse, the question of the poem’s encompassing form and scaling remains a problem for the Cantos as it does not for Homer’s epics, with their flowing narratives, unifying meters, and self-similar episodes. Until Powell, the usual mistake was to scan lines like these with iambs, trochees, anapests, and dactyls, in their miscellaneous combinations and permutations, and leave it at that. Following Pound’s hints, Powell traced the poet’s rhythms to the larger, knottier metrical configurations of Greek lyric poetry, specifically the Aeolian verse forms of Sappho and Alcaeus and the choral meters of the great tragedians. Pound’s reliance on the complex meters of the Greeks, in contradistinction to Eliot’s insistence on a “simple form, like the iambic pentameter,” marks perhaps the most notable difference between their poetic practices. Pound seized on this point in his essay on Eliot, complaining that Eliot’s “article was defective in that he omitted all consideration of meters depending on quantity, alliteration, etc.” Yet only when we see that the two poets’ methods were closely related can we begin to understand the better tradition of free verse that originates not in the visual prosody of the print age but in the auditory imagination. (shells given out by shells); choriamb (shakes the dry pods) –correspond on a small scale to the Greek myths animating much of the poem at a higher scale. No “predetermined pattern” governs these lines: no matter how thoroughly we analyze their accentual patterns, we will never be in a position to predict the rhythmic shape of a given line, will never find a preordained metrical pattern. What counterpoint Pound’s rhythms can achieve, they will play not against the reader’s expectation, against the meter … but rather, against their own echo in the auditory memory. In order to play off their own echoes in the auditory memory, the lines must be self-similar. Unlike Pound’s more massive metrical units, the simple binary pattern of the iamb, which he was so anxious to break, offers almost infinite possibilities for modulating and enjambing rhythms. A line of iambic pentameter, for example, can sustain variations in all five of its feet and still keep its integrity. Lines of blank verse can run over to form verse paragraphs, as in Milton’s poetry, and thus preserve that crucial characteristic of complex dynamic systems: flow. In addition, the iambic matrix is so holistic that an unstressed or lightly stressed syllable, placed in the right position, can be “promoted” to–and heard as–an accented syllable, thus maintaining the pattern. We need to recognize the sharp distinction between Pound’s “free” verse and that of his less musically ingenious contemporaries, and Powell’s essay is an invaluable resource in that regard. And lest we continue to talk blithely of a Pound-Williams tradition, or–more abominably–of a Walt Whitman-Williams nexus, let us turn now to that grandfather of modern free verse, Whitman, whom Pound addressed as “pig-headed father” in “A Pact,” and to whose poetry Eliot paid discreet homage from his first poems to his last. Once we examine the work of this archetypal American poet, we will see that the barbaric howls and yawps of his imitators only testify to their deafness to his often subtle music. Numerous attempts, none wholly satisfactory, have been made to codify Whitman’s prosody. One faction holds that his primary formal device is accentualism. These critics show how Whitman begins with a simple repeated pattern–of, say, five or six accents per line–and varies his rhythm by shifting the placement of caesuras from line to line. Another group claims that Whitman’s prosody is based on syntactic parallelism. Finally, some commentators use the traditional feet of scansion in English–iamb, trochee, dactyl, anapest–to scan Whitman’s verse, uncovering lines and passages composed of one or more of each. (Annie Finch’s perceptive recent study The Ghost of Meter is an exemplar of this school.) The traditional metrical approach has been the most fruitful for analyzing individual poems and offers the most coherent and compelling account of Whitman’s modus operandi. The truth is that Whitman uses all the stratagems listed above, often merging and blending them with passages of prose. He keeps our attention (usually) and maintains the integrity of his verse even in such passages through the felicity of his language…because he is, even at his windiest, what Eliot once called him: a master of our prose. To this hodgepodge of prosodic explanations, I now propose to add another. I wish to expand our metrical vocabulary to account for Whitman’s rhythms. For though dactyls and iambs are frequently the atoms of which his lines are made, those particles often coalesce into multiplex “molecules,” and it is Whitman’s manipulation of these that gives his work its distinctive character. These larger units of rhythm occur with enough regularity to fit our definitions of self-similarity and so further our inquiry into how vers libere and logaoedic verse might augment the metrical tradition and resemble complex dynamic forms. Pound was right when he said, in “A Pact,” that he and Whitman “have one sap and one root.” Applying Powell’s Greek nomenclature, we can identify Whitman’s meters above as choriamb (“politics, fail”), dodrans (“Only the theme I sing”), and aristophanean (“Whirl me I know not whither” and “strong-possess’d soul, eludes not”). Of the aristophanean, Powell explains that when standing alone as a line or ending a line, the final syllable may be short or long–but whether we trot out its technical name or call it a thing that goes “Bum di di Bum di Bum di” or “Bum di di Bum di Bum Bum,” Whitman uses this shape with such frequency in his poems that it amounts to a rhythmic signature. “Quicksand Years” also represents a clear case of fractal scaling. In it Whitman repeats several metrical rhythms, making his lines self-similar, yet he alters and admixes these shapes with others to break their too-strict symmetry. In addition, the poem’s central theme–that only the strong soul can resist the fluid slippage and drift of time–mirrors at a higher scale the dramas enacted in the rhythms, which maintain their integrity within the temporal flux of the verse. The more closely we attend to Whitman’s verse, the richer and more rewarding it appears; poets who try to emulate him merely by aping his meandering lines and syntactic parallelism delude themselves and devalue Whitman’s achievement. Much more than syntax and word order are repeated; the lines are rhythmically similar at the level of foot and syllable. The second line in the first excerpt above is perfect anapestic hexameter. The line that follows is nearly identical; the line preceding is anapestic with a few variations. The rhythmic repetitions occur in these and other passages with such consistency that we can be sure Whitman heard and intended them. Dactyls and anapests were in the air during the period when Whitman wrote Leaves of Grass; but how do we account for the presence of so many adonics and choriambs, since Whitman didn’t ever study Greek? Of course, the larger feet can be broken down into trochees, dactyls, and iambs, but in many of Whitman’s lines the Aeolic figures maintain their integrity so surely and occur so often that it seems they, and not their constituent particles, are the key elements of his verse. A more serious and cogent answer to the question of Whitman’s meter lies in modern systems science. After all, one core principle of chaos theory is that complex systems are self-organizing. If so, then the Aeolic shapes might be said to have organized themselves from Whitman’s rhythmic improvisations, drawing with them the whole substructure of Greek lyric poetry. Whitman’s meters might then be said to have arisen out of the same matrix (or from the same “roots”) as did those of Sappho’s poetic forebears. In the language of chaos theory, choriamb, adonic, and dodrans might be considered metrical “attractors” that drew Whitman’s dactyls and iambs, accentual patterns, and syntactic repetitions into metrically similar shapes, just as they had done millennia earlier to the lines of ancient Greeks. Whitman’s fitful and somewhat scattershot use of these meters resulted no doubt from the fact that he worked in isolation, without the support of any institution or known tradition. At times, the poet himself–who might, in fact, have been as cheerfully indifferent as Aeschylus or Euripides to the gummed-on “superstructure of nomenclature”–must have assumed that the sole source of his novel poetics was the syntactic repetitions and parallel constructions he’d borrowed from the King James Bible. Why does the line beginning stanza five have eight syllables instead of the expected nine, or the penultimate line of stanza four have six syllables instead of seven? The answer is simple: both lines have become iambic. The overall cadence in the passage is iambic, spliced with a few surviving syllabic lines. Poets often use odd-numbered counts in syllabics in order to resist the tendency of even-numbered lines to turn metrical. In her original pattern, some of Moore’s lines were even; at some point the syllables started reacting to this numerical constraint and coalesced into iambs, thus causing the odd-numbered lines to convert to an iambic beat and skewing their syllable-counts accordingly. 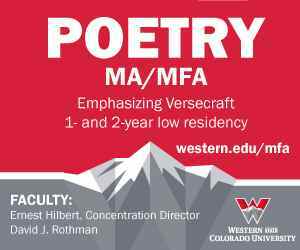 As these examples suggest, verse doesn’t want to be free, though modernist and postmodern poets have hatched strategies to spatialize and fragment it into a dubious sort of freedom. After more than a century of experiment, it’s time to take a hard look at the results. The myth of the avant-garde has led poetry into ever-increasing entropy and now, in the work of some contemporary L-A-N-G-U-A-G-E poets, propels it toward thermodynamic heat-death. Chaos science offers a counterexample by showing how order arises spontaneously from seeming randomness when rules are allowed to interact with the workings of chance. As Pound and Eliot have proposed, poetry has a mind of its own. If poets immerse themselves in that mind–and listen to what they write–poems will self-organize into beautifully intricate shapes. This process involves recursion, involution, and the continuous fine-tuning of feedback. Paul Lake - who has written 7 posts on Contemporary Poetry Review. Paul Lake is a professor of English and creative writing at Arkansas Tech University. He graduated from Stanford University with an MA in Creative Writing and English. He has published two volumes of poetry, Another Kind of Travel (Chicago), and Walking Backward (Story Line), along with a novel, Among the Immortals (Story Line), a satirical thriller about poets and vampires. His poems and essays have appeared in numerous journals, including Poetry, The New Republic, The American Scholar, Yale Review, Southern Review, Paris Review, Partisan Review, and Sewanee Review.